Experiencing the reveal of an all-new Forza game at E3 is quite different to following the action online from the comforts of your home. In fact, to be at the world debut of Forza Motorsport 7 at E3 2017 last year, which was revealed alongside Microsoft’s Xbox One X console, felt surreal. Being the flagship showcase experience for the new system meant last year’s Forza reveal was even more special than usual – and it was full of unique coverage opportunities and unforgettable experiences. With a new Forza game on the horizon for E3 2018, now feels like the perfect time to cast our minds back to Forza Motorsport 7’s reveal last year and take you behind-the-scenes on what it’s like to experience the world debut of a brand-new Forza title in-person. This is the Forza Motorsport E3 experience – and it’s something every Forza fan should have the opportunity to do for themselves. Let’s begin by discussing the weeks leading up to E3 2017. The specs of Project Scorpio, the codename for Microsoft’s new Xbox One X console had been revealed in an exclusive story by Digital Foundry. Our first ever glimpse of the ForzaTech engine running on the system was also teased to us in a native 4K screenshot captured directly from the console. This was our first ever look at Forza Motorsport on the Xbox One X, and it was a stunning image. Our first glimpse of ForzaTech on Xbox One X came in the form of this beautiful screenshot. In the lead up to June, I had been invited by Microsoft and Turn 10 Studios to attend E3 2017. I received invites to their Media Briefing at the Galen Center, their showcase event the following day, their behind-closed-doors demos at the Los Angeles Convention Center to check out all the upcoming first-party exclusives, and of course, to see the world debut of Forza Motorsport 7, or ‘Apollo’ as we referred to it back then. Apollo was the codename used for the upcoming racing game, and it was the reason I was hosted at E3 2017 last year by Xbox UK and Forza Motorsport. Knowing that I would be at E3 2017 in Los Angeles – hosted there by Microsoft and Xbox for the world debut of their all-new Forza Motorsport racing experience codenamed ‘Apollo,’ and the reveal of the new Xbox One X console, felt unreal. The excitement started to build up more and more as the weeks went by, and soon enough, the long trip to Los Angeles was upon me. It’s an 11-hour flight to get there, but every bit of travel was worth it. After a weekend in Hollywood for the EA Play event, the first thing on my agenda in Downtown, Los Angeles was the Xbox E3 2017 Media Briefing. This is where Microsoft would finally reveal the name, price and design of its Xbox One X console – and debut its flagship gaming experience for the system, Forza Motorsport 7. The world was just moments away from learning about Project Scorpio and Apollo, but ahead of the briefing, there were a couple of unfortunate leaks, including one for Forza Motorsport 7 that saw screencaps from the trailer shared online, as well as two for Project Scorpio. The Game Awards host and producer Geoff Keighley shared the $500 price tag for the console on Twitter, whilst its design also surfaced online ahead of the briefing. Regardless, I was still excited for what was to come – even more so now that we had a better idea of what to expect. Registration for the Media Briefing was done online ahead of my trip, so all I needed to collect was my lanyard, be given my seat allocation, and then head inside the Galen Center. 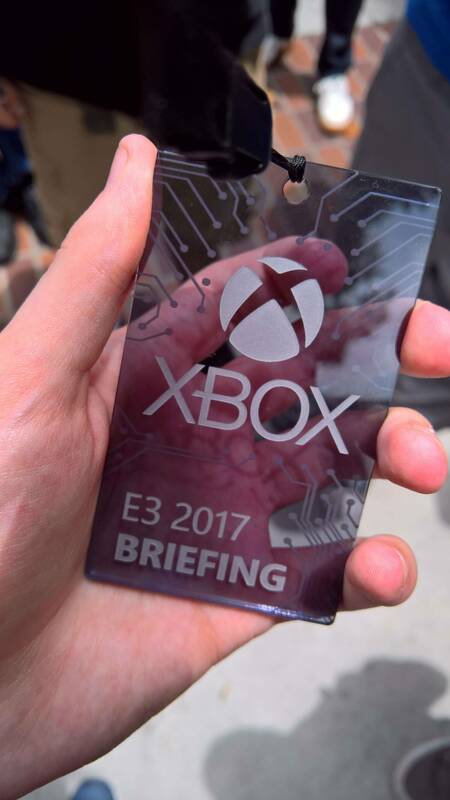 The lanyard featured a chip based on the renders we had already seen of Project Scorpio, whilst after a short wait in the queue, we could finally head inside. We were sat for about 20 minutes or so before the keynote begun. This was to ensure everyone was inside, seated and ready ahead of the big show. I’ve been watching the Xbox E3 Media Briefings since 2009. In fact, I was 12 years old when I watched an Xbox E3 conference live from home for the first time. I loved everything about it – from seeing the world premieres of the latest and greatest games to discovering the latest features coming to Xbox 360 and Xbox Live, as well as experiencing the world reveal of Microsoft’s motion-sensor device ‘Project Natal’ – later to be known as Kinect. Now, for the first time, I was going to be watching an Xbox E3 briefing in-person. 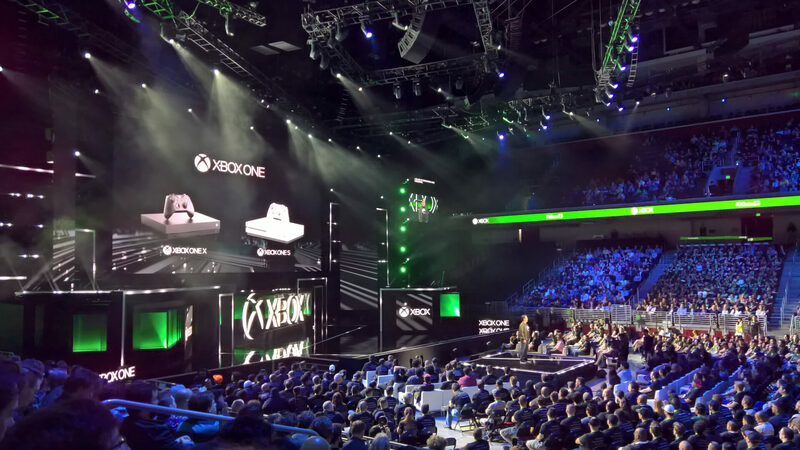 The conference started as the lights dimmed with the world premiere trailer of the Xbox One X – officially showcasing the design of the system for the first time. It wasn’t until Phil Spencer, Head of Xbox appeared on stage to formally announce the name of the console under the fitting mantra, ‘There’s No Power Greater Than X.’ After a quick rundown of the specs and features of the Xbox One X from engineering lead Kareem Choudhry, we had our first glimpse of a game running on the console – and yes, it would indeed be Apollo, or as we could now finally call it, Forza Motorsport 7. The trailer opened with a desert-like environment and what felt like unusual music at first. There were camels, a blazing hot sunshine, and a glimpse of a city. This was Dubai, but at first, you wouldn’t think it was a Forza game. It looked fantastic. The trailer then went on to show a driver walking towards the Porsche 919 Hybrid race car, and suddenly, it became clear that was indeed the next all-new Forza title – built and tailored specifically for the Xbox One X console. 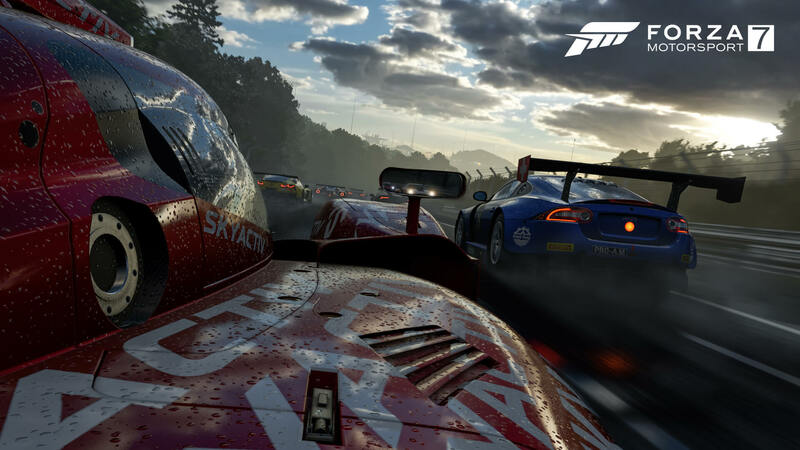 Once the trailer had concluded, which confirmed the return of fan-favourite track Mugello to Forza Motorsport 7, the Creative Director of the Forza franchise Dan Greenawalt was welcomed onto the stage. There was something a little missing from this Forza reveal that would typically accompany all the others before the reveal of the game – and that was the cover car. Earlier in the year, Microsoft had announced a six-year, multi-project partnership with Porsche. The automaker’s supercars would finally make their debut in Forza Motorsport 7 from launch without being forced upon as standalone paid downloadable content. However, the real spectacle moment came as Greenawalt unveiled Porsche’s latest beastly supercar – the 2018 911 GT2 RS, the most powerful road-going 911 in the world. Fitting as the Xbox One X is the most powerful console in the world, too. 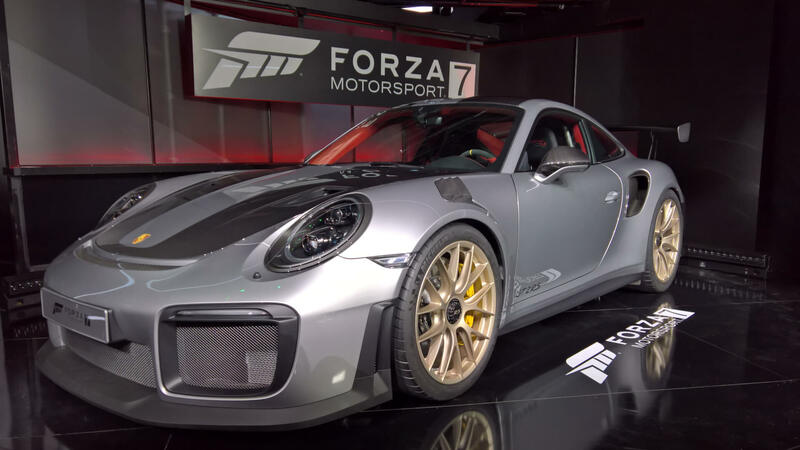 The world debut of Forza Motorsport 7 and the 2018 Porsche 911 GT2 RS at E3 2017. The reveal of the 2018 Porsche 911 GT2 RS on Microsoft’s E3 stage was a first. Never had a car been debuted at a gaming tradeshow before but Turn 10’s convergence of gaming and car passion was finally showing as the games industry and automotive industry had joined forces for this one-of-a-kind reveal. It was a pure spectacle – and the excitement felt inside of me as the car was unveiled to the world was immense. This was the first time anything like this had happened – and I was there to experience it in-person. 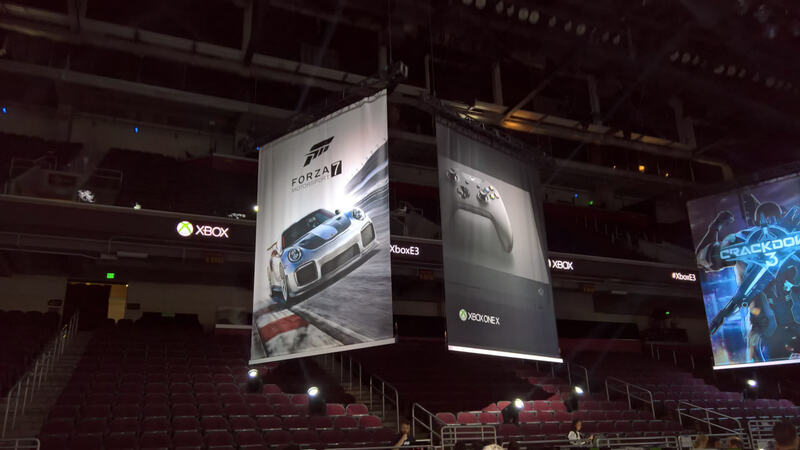 Microsoft has had their cover cars on their E3 stage before – from the Audi R8 to the McLaren P1 and Ford GT. But this was the first time that they were announcing the car on behalf of the manufacturer, and it was a truly epic moment. However, the excitement didn’t stop there. Professional drivers Shannon McIntosh and Verena Mei are two presenters for Microsoft’s Forza Racing Championship esports series, and both were invited on-stage for the live gameplay debut of Forza Motorsport 7. This was the first time the public were about to be shown actual gameplay footage of Turn 10’s latest highly-anticipated racing game, running in native 4K at 60fps on the Xbox One X. 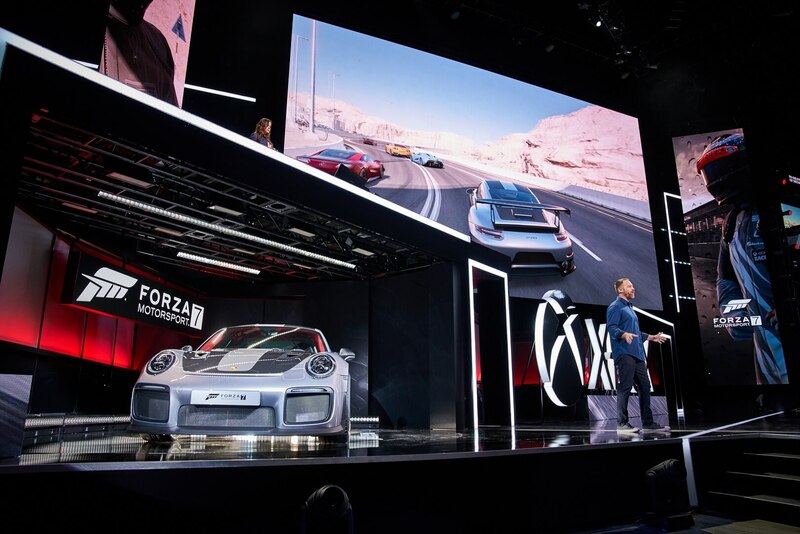 The guided demo featured the game’s Dubai track, the latest “jewel crown” of the Forza franchise, where Shannon McIntosh would be taking the 2018 Porsche 911 GT2 RS for a test drive alongside other exotic supercars featured in Forza Motorsport 7 through one of the greatest driving roads in the world – the Hafeet Mountain Pass. Excitement levels rose as the audience saw the power of Xbox One X in-action for the first time. Meanwhile, Verena would be driving a Nissan GT-R Super GT race car on the Nurburgring GP circuit alongside other modern-day race machines. This is the moment dynamic weather was revealed for Forza Motorsport 7, as ominous skies rolled in before a thunderstorm with heavy rain and lightning dispensed across the Ring. Experiencing it at the Galen Center in Los Angeles literally sent shivers down my spine as the thunder clapped and the bursts of lighting had everyone’s full attention. Car parts where also rattling and vibrating to the world around them, whilst the end of the demo saw the grey skies drowned out by a beautiful sunset as the rain had passed and evening approached on the Ring – covered in puddles that grew and expanded throughout the rainstorm. It was a pure visual spectacle to say the least as Forza didn’t have anything like it before. 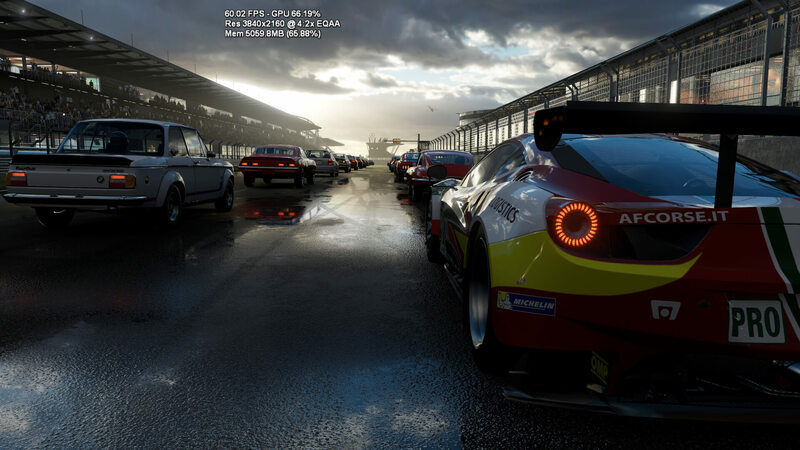 Greenawalt concluded the presentation by revealing that Forza Motorsport 7 would ship with over 700 Forzavista cars from more than 80 manufacturers – all fully explorable and drivable with working cockpits and damage, including the largest line-up of Ferraris, Lamborghinis, and Porsches in any racing game. It’s the biggest line-up of cars to have ever been featured in a Forza title and the same can be said for the track roster, too. It’s an enormous amount of content – and it’s also the most visually-pleasing Forza game to-date. It’d ship on Xbox One and Windows 10 PC on October 3rd, 2017 and would be ready to take full advantage of the horsepower inside the Xbox One X on November 7th. The two race events that were showcased would also be playable on the E3 showfloor for both media attendees and the public. 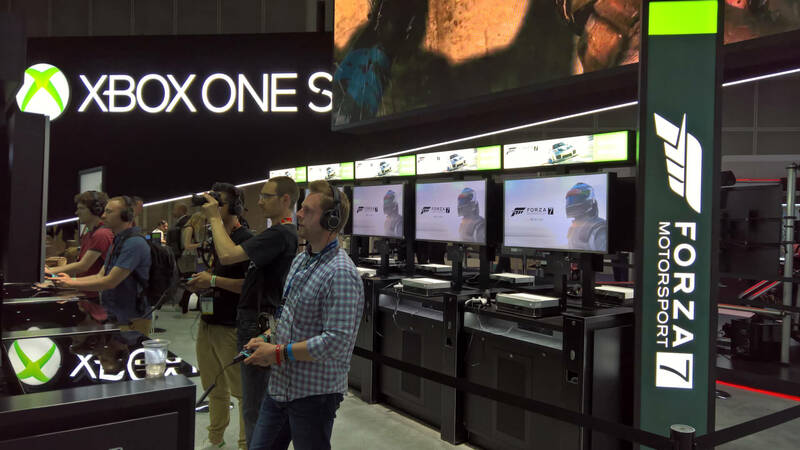 This was the first time the convention allowed members of the public inside – so more people would be getting their hands on with the latest Forza title at E3 than ever before. However, this was only the reveal of Forza Motorsport 7. There was still plenty to come over the days ahead, including a scheduled behind-closed-doors demo of the game and of course, my own hands-on experience with it. As well as that, I also had plenty of questions for the development team – who’d I’d be meeting both after the briefing and in the days ahead. The Xbox E3 conference continued with a variety of trailers and announcements, including the $499 price reveal of the Xbox One X, as well as reveals for Crackdown 3, Sea of Thieves, State of Decay 2, and Ori and the Will of the Wisps. However, as the briefing concluded, and attendees begun to leave the Galen Center, the 2018 Porsche 911 GT2 RS was brought back onto the stage. For some, this was the opportunity to grab interviews and record videos, but for me, it was time to get up, close and personal with the Porsche’s latest flagship supercar. To no one’s surprise, the 911 GT2 RS was well protected by security. 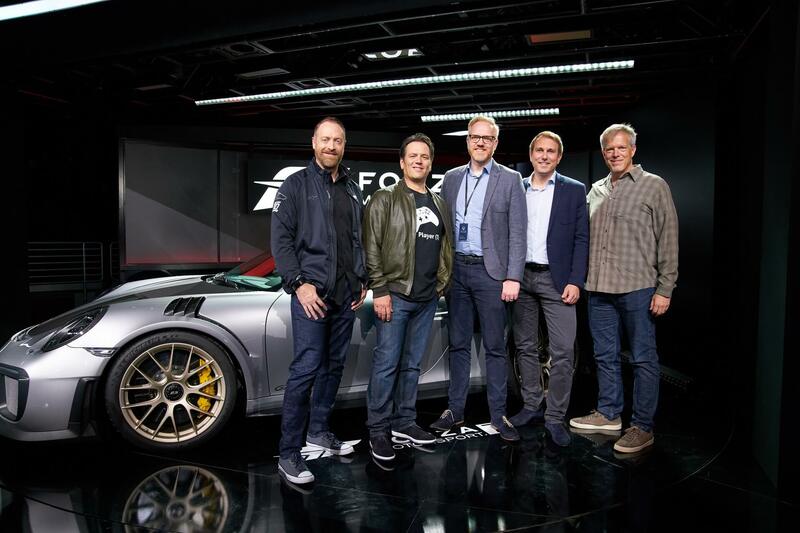 Microsoft were planning to do a photo shoot with Xbox and Porsche executives, as well as Forza developers around the car, including Phil Spencer of Microsoft, as well as Alan Hartman, Dan Greenawalt and Chris Tector of Turn 10 Studios. Dan Greenawalt, Phil Spencer, and Alan Hartman with Porsche's latest flagship supercar. Before all this, however, I had the chance to look at the car up closely, take some photos, and the enjoy the sheer beauty and technical prowess of Porsche’s latest supercar. It was a moment not to be missed for any Forza or car enthusiast. It was a real privilege to be this close to the Porsche 911 GT2 RS – the cover car of Forza Motorsport 7, only an hour after its world reveal. After I had snapped a few photos of the car, I ran into Dan Greenawalt and the team at Turn 10 Studios – congratulating them on the announcement of Forza Motorsport 7, sharing my first thoughts and overall excitement about the game, and of course, discussing all things Forza and E3-related. Ralph Fulton of Playground Games was also in-attendance, and whilst he wasn’t on-stage, it was announced by Phil Spencer that Forza Horizon 3 would be receiving enhancements for the Xbox One X – and what an excellent upgrade that was when it shipped in January of this year, with a native 4K resolution output and improved texture quality across the board. It’s an unmissable release if you’re a Forza Horizon 3 fan. Here's my own personal shot of the 2018 Porsche 911 GT2 RS. Yep, I got right up close to it. Catching up with the team from Turn 10 and Playground to congratulate them on their announcements and talk about everything Forza-related was a great way to conclude my Xbox E3 2017 briefing experience, but there was still plenty of buzz online. 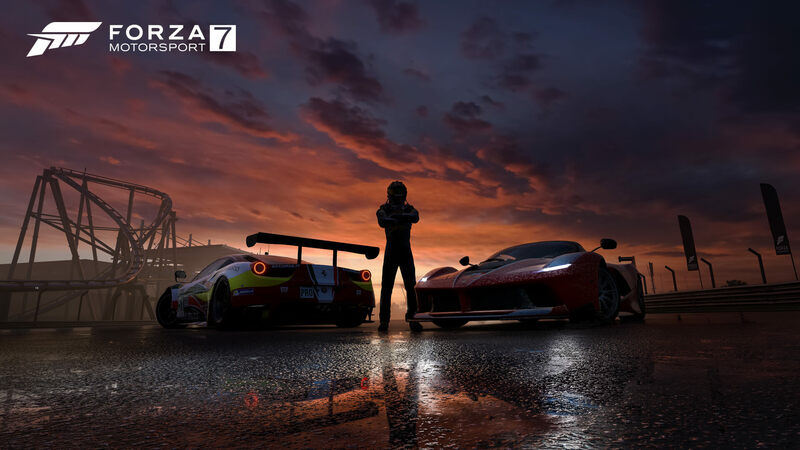 The Verge had posted an exclusive Forza Motorsport 7 feature story that detailed some of the headlining new aspects in the game, including the addition of Driver Gear outfits and the reworked audio system. There was also the official press release and the first screenshots taken from the game revealed as coverage and content begun to pour out onto the internet. Excitement was immense to say the least, but fans were eager to learn and see more on Forza Motorsport 7, as was I. The next morning was yet another highlight of the trip – the Xbox Media Showcase event, where I would get hands-on with all the latest Xbox One and Windows 10 PC exclusives, including Forza Motorsport 7. After hearing so much about ‘Apollo,’ it was almost time for me for finally get my hands on with it and I couldn’t have been more excited. Not only was I looking forward to driving the Porsche 911 GT2 RS on the all-new Dubai circuit in 4K HDR at 60fps, but I was curious to see what other changes would be found in the demo, such as the handling and physics and the HUD elements. The Xbox Media Showcase in one shot! You can even see the Xbox Daily show being filmed. The Xbox Media Showcase event was held at the Galen Center – the same venue where the Xbox E3 Media Briefing had been hosted the day before. There were several hands-on stations for Forza Motorsport 7, which was running on the Project Scorpio Development Kit. These are the large white XDK boxes featuring the screen on-front with even beefier specs than the actual Xbox One X retail console – the same ones used at the recent Forza Racing Championship Pre-Season Invitational in Seattle. These were tailored to represent the native 4K experience delivered by the power and performance of Xbox One X – and the Forza Motorsport 7 demo was a real showcase of this. Each station also had a capture device to record Forza Motorsport 7 in its full 4K quality, so each media outlet, journalist and influencer in attendance could share exclusive gameplay onto YouTube or other video platforms. The first moment I got hands-on with Forza Motorsport 7, I was blown away by the realism of the Dubai track. The location was created using a new development technique called photogrammetry, which involves taking photos of an environment in real life before mapping it out to pure accuracy during development. This was backed by the game’s use of 4K textures and assets, as well as excellent lighting effects delivered through High Dynamic Range (HDR). First impressions of Forza Motorsport 7 from E3? It looked beautiful and played amazing. Besides the impressive visuals, the rest felt familiar. It was Forza Motorsport, but this time in 4K with a new track environment and its just-revealed cover car, accompanied by the sheer beauty of the game and its new motorsport-inspired soundtrack. The improved audio effects were also to be heard, whilst a selection of Driver Gear outfits was available to choose from for each two-lap race available in the demo. Whilst I spent a lot of time enjoying the new 911 GT2 RS on Dubai, I also spent as much time checking out the other two race events in the E3 Demo. The first of these included the Mercedes-Benz Tankpool Racing Truck on returning fan-favourite Mugello, as well as the Nissan GT-R Super GT race machine on the thunderous and rainy Nurburgring to showcase the game’s all-new dynamic weather features. It was a pleasure to finally drive on the newly-recaptured Mugello in Forza Motorsport 7, and the decision to put a total of 24 Mercedes-Benz Tankpool Racing Trucks into one race – each with different liveries applied, is one that pleasantly surprised me. It’s nice that Turn 10 took the opportunity to show that the inclusion of this truck isn’t just because driving it around tracks is fun, but that it can also be used for serious racing events. Truck racing is indeed part of motorsport and the Forza Motorsport 7 E3 demo did a good job of highlighting this. However, the most memorable of the trio of race events in the demo is the Nissan GT-R Super GT race car on Nurburgring. This one wasn’t only thrilling and immersive, but it was one of the most unique races I had played in Forza Motorsport to that date. The introduction of dynamic skies and weather in Forza Motorsport 7 was a real plus point. Weather conditions in past Forza Motorsport games had always been static – be it daytime, during the rain or at night. 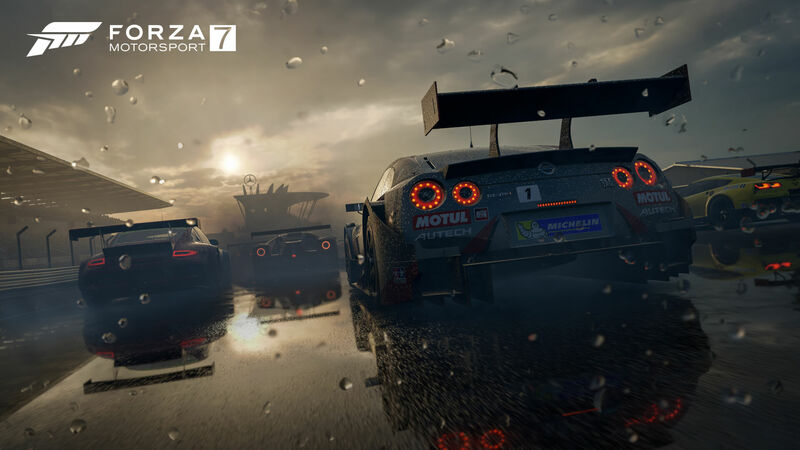 Forza Motorsport 7 introduced dynamic skies and weather conditions and the Nurburgring event saw the two-lap race commence with dark, ominous clouds that suggested a storm was brewing. Soon after, the rain began to pour as the clatter of thunder rattled into my eardrums. All while I was soaking in the visual spectacle that was happening throughout all of this. This demo race highlighted the new technical innovations and feature implementations better than any other race event in Forza Motorsport 7’s E3 Demo, and it was by far the most memorable of the bunch. If you’d like to check out these events for yourself, you can do so in the free Forza Motorsport 7 Demo available on the Microsoft Store for both Xbox One and Windows 10 PC. 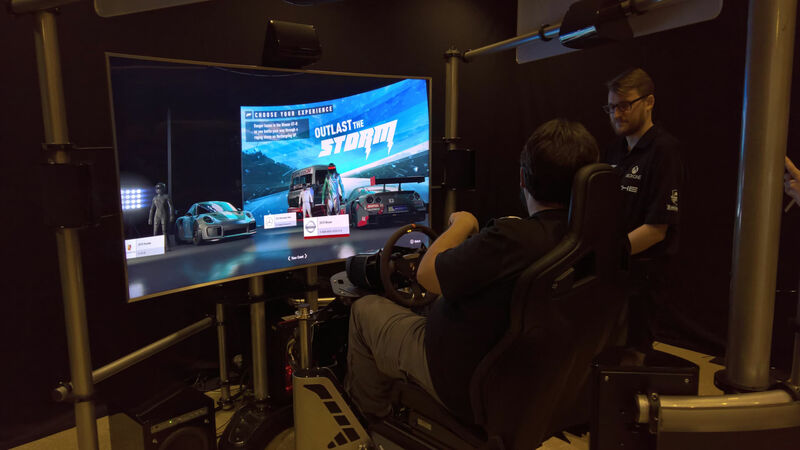 In addition to the hands-on stations, which allowed attendees to enjoy Forza Motorsport 7 with a controller, I also had the chance to check out the game on a motion wheel-rig setup. This expensive piece of equipment demoed the Windows 10 PC version Forza Motorsport 7 and featured the very same race events as the E3 Demo. The hydraulics of this motion rig were immense – and you literally feel like you’re being swung around the car, it’s awesome. I enjoyed the Dubai event, but it was challenging. Yes, there were plenty of crashes and I may not have finished high-up the grid, but at least I got to experience how incredible this motion simulator rig is when it’s in-action. If I had one of these at home, then I’d probably switch to the wheel for most of my Forza Motorsport 7 sessions. This simulator rig for Forza Motorsport 7 literally throws you around. Intense, but awesome. There was also a special Xbox One X demo experience at the showcase event where attendees received a detailed technical walkthrough of the new console. This included a Gears of War 4 demo showcase to highlight Dolby Atmos surround sound – which is extremely impressive technology I should say. Naturally, we also had a look at the sheer beauty of Forza Motorsport 7 on the console hooked up to a large 4K HDR display, featuring insight from the Studio Software Architect of Turn 10 Studios and the mastermind behind the technically-brilliant ForzaTech engine powering the game, Chris Tector. Outside of the demo experience, we could also get Xbox One X pins with our names or Gamertags engraved onto them – a nice souvenir to bring home! Forza Motorsport 7 on the Xbox One X. The 4K console's flagship racing experience. And, it was. The demo looked amazing and played even better – and the good news for fans kept coming. Whether it was returning tracks like Mugello and Suzuka or features like the Auction House, Forzathon and the new championship-inspired career mode, there were plenty of reveals to keep players eager for Forza Motorsport 7. I enjoyed my general chitchat with Dan, and it was great to share my thoughts on the demo and game after playing it. We’d be talking again at the Los Angeles Convention Center once E3 properly began, which is when I’d also have the chance to experience the eagerly-awaited behind-closed-doors demo of Forza Motorsport 7. The Los Angeles Convention Center and its surrounding area is almost like heaven for gamers. Posters and banners featuring the latest game artwork adorns the location, including the famous Call of Duty banner that highlights the relevant game of that year. For 2017, this was of course Call of Duty: WWII. 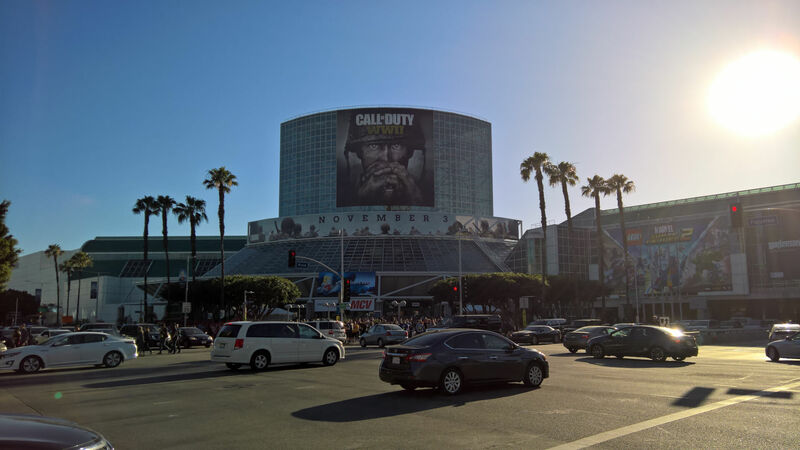 I’ve seen the Call of Duty posters on the Los Angeles Convention Center in photos shared online every year, but this was the first time I had got to see it in person, and ultimately, it felt surreal. It’s such an iconic part of E3 and I got to see it for myself at long last. Anyways, we weren’t here for Call of Duty, we were here to see even more on Forza Motorsport 7. Here's a nice shot outside the Los Angeles Convention Center that I captured during E3 2017. 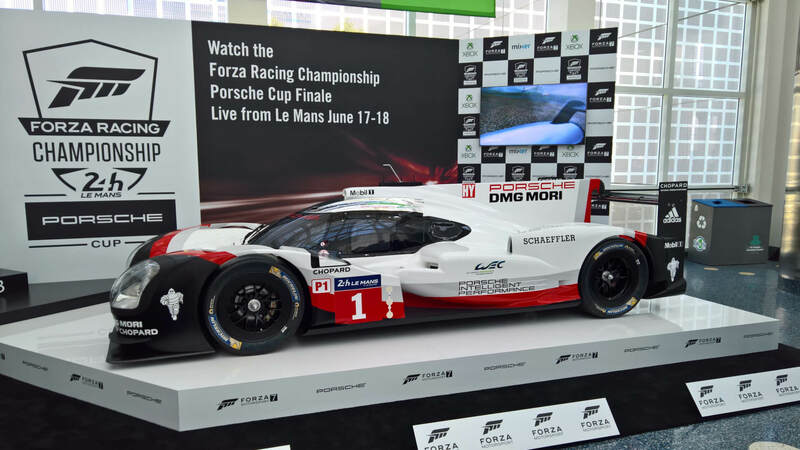 One of the first things I noticed inside the South Hall of the convention center was an outer shell model of the Porsche 919 Hybrid Le Mans race car – the same one found in the Forza Motorsport 7 reveal trailer. It was there to not only celebrate one of the most prestigious events in motorsport later that weekend – the 24 Hours of Le Mans, but also the Forza Racing Championship Season 3: The Porsche Cup finals being hosted trackside on the same weekend. In fact, esports was being recognized as an official category for that weekend’s racing event and the winners of The Porsche Cup finals would be standing on the same podium used by the actual race champions. This would become a celebration for the entire Forza community, but for those of us in Los Angeles at E3 who couldn’t make it to the finals, it was great to see it recognized at the convention center. There was also a small podium where you could have your photo taken holding a trophy, which I unfortunately didn’t get a chance to do. It was extremely cool nonetheless though, and it was a great presence for the Forza Racing Championship that all E3 attendees were sure to have come by at some stage during their time at the convention. The Forza Racing Championship showed up to E3 2017 with Forza Motorsport 7 in-style! There was a lot of buzz and chit-chatter about Forza esports from Turn 10 at E3 2017. Not only did we have presenters from the Forza Racing Championship showcase the live debut gameplay of Forza Motorsport 7, but the topic was brought up numerous times from the developers. There was clearly a lot of passion and dedication for this from Turn 10, and the team were extremely proud of the fact that Forza Motorsport 6 players would be standing atop the podium at the 24 Hours of Le Mans. 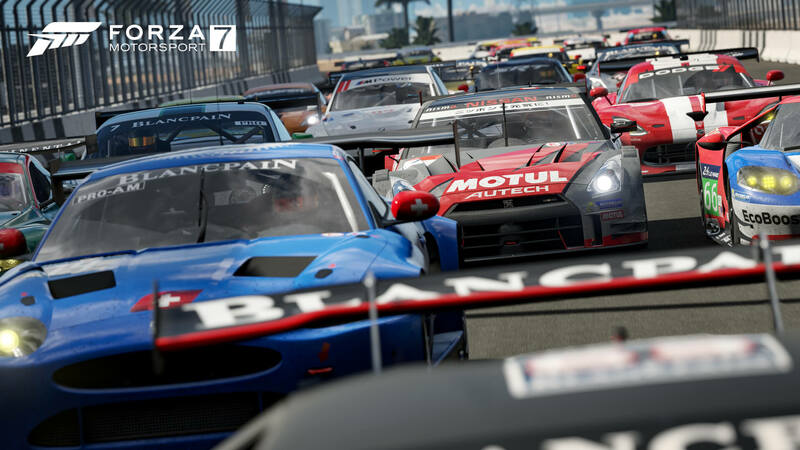 The E3 Demo for Forza Motorsport 7 called it “The Ultimate Esport,” one that would be both accessible and competitive, and sure enough, this was reiterated multiple times by Turn 10 Studios at E3 2017. As a fan of the Forza Racing Championship and the competitive community, this undeniably left a smile on my face. Turn 10 Studios were committed to not only making Forza Motorsport 7 a great competitive esports game to play, but also an immersive spectator sport as well. At the behind-closed-doors demo for Forza Motorsport 7, which took place at a private area behind the Xbox booth – exclusive to media attendees with appointments, I was given an even deeper look at Forza Motorsport 7. It was a walkthrough of a work-in-progress full version of the game, and we were guided through this demo by the game’s Creative Director, Bill Giese. 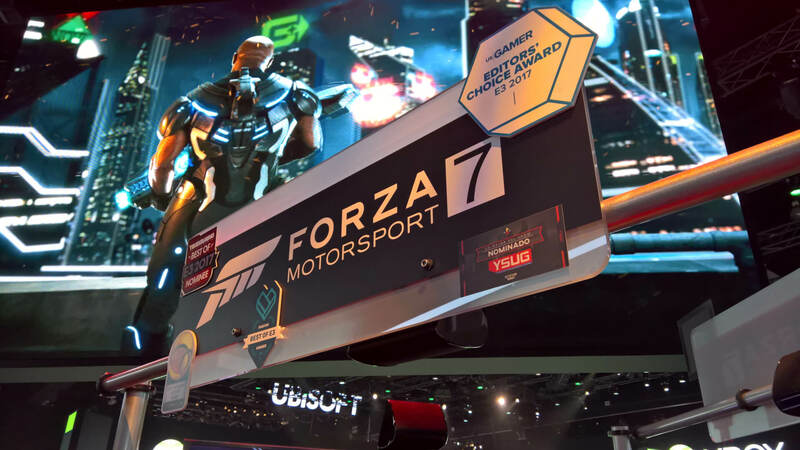 Forza Motorsport 7 won a variety of awards at E3 and these were displayed in the Xbox booth. We were shown the main menu of the game and everything it featured, including a deep look at the Forza Driver’s Cup career mode. From its overall structure to the various championship divisions and showcase events, which award rare cars that can’t be found anywhere else. The inclusion of automotive personalities and stunt drivers like Ken Block and Tanner Foust was also revealed for the first time. Giese walked us through a race event on the Dubai circuit, which is set in the scorching hot sunshine. One of the biggest focuses of Forza Motorsport 7 from Turn 10 was to ensure that every time a player returned to the track – it felt different. Be it the weather, clouds or shadows, there’s a lot of things that can change each time you revisit a race circuit. I remember him showing us a quick video of how the weather and sky adjusts based on the time-of-day and current race conditions, and it looked incredible as each scene made the track look completely different. It was special. He explained how the cloud shadows move across the track, changing the perspective of the race, whilst after a rainstorm, the sun is unleashed from behind the clouds to result in a breathtaking finish across the line. Clouds form and change during wet races in Forza Motorsport 7 as a thunderstorm approaches. 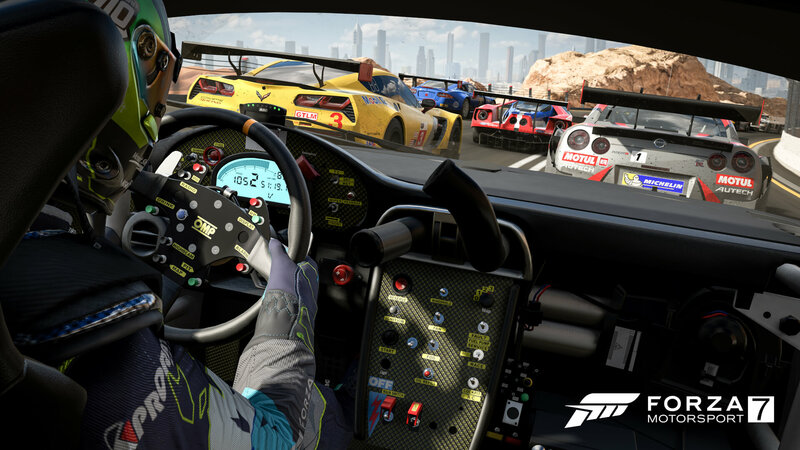 During the demo, he also noted three key areas that were being focused on for the game; and these included the fact it was being built to the best-looking Forza game to-date, a reimagining of the core gameplay systems to return the series back to its roots of competitive racing, and finally, with millions of players engaging with the Forza franchise every month, Turn 10 wanted to unite them all with a broad range of community and online features in Forza Motorsport 7. The behind-closed-doors demo also revealed various other features and improvements in the game, including the ability to explore your car trackside using Forzavista before the beginning of a race event, whilst the new interactive loading screen was also showcased. This allows players to change their car and Driver Gear suit, their assists and tune, and go from race-to-race-to-race configuring the car, track and conditions on the fly. It’s a vast change to previous titles. The behind-closed-doors demo was the ultimate first-hand walkthrough of Forza Motorsport 7. Another heading feature shown to media attendees was the ability to play music stored on OneDrive through the speakers both trackside and in your virtual garage. Unfortunately, this feature has yet to be added to Forza Motorsport 7, and it currently remains unknown as to whether it’ll be added in the future or not. The session concluded with a short Q&A segment, which was my opportunity to ask various questions on Forza Motorsport 7, including one about a highly-requested adjudication system, which has since been confirmed to be added to the game in the future as ‘Forza Race Regulations.’ Overall, the demo provided a lot of insight into the core Forza Motorsport 7 experience and the vision the team at Turn 10 Studios had for this game. Competitive racing and esports were prime focuses for the team in Forza Motorsport 7. Writing the preview for this one resulted in one of my favourite articles to this date, and even after almost 12 months on, I enjoy looking back on this story. It was an incredible experience no doubt, and an article that provided a lot of insight into Forza Motorsport 7 for those who couldn’t make it to E3 or see the behind-closed-doors demo that was exclusive to media attendees. As the end of the week approached – and the end of E3 2017 for that matter, I had a variety of scheduled behind-closed-doors demos for other titles, including Crackdown 3, State of Decay 2, and Sea of Thieves. However, with Forza being the focus, it’s time to move ahead to something I was really looking forward to – another conversation with the franchise’s Creative Director, Dan Greenawalt, in the form of an interview about all things Forza Motorsport 7. Despite all the information from the briefing and behind-closed-doors demo, and even from the official online announcement and the titbits I heard from the media showcase, there was still plenty to discuss. The Forza Motorsport 7 demo stations at the Xbox booth. No Porsche here, unfortunately. From the Forza Driver’s Cup to new multiplayer and online racing features, Greenawalt offered some excellent insight into the vision and overall automotive package that is Forza Motorsport 7. It was my last major appointment at E3 2017, but it was undeniably a fitting way to conclude the show. There was lots of coverage to be prepared though, some of which I’d do in Los Angeles before the long trek home, whilst the rest would be published sometime later. This included a hands-on impressions story for the E3 Demo, a preview based on the behind-closed-doors demo, as well as plenty of breaking headlines on Forza Motorsport 7 from the showfloor that I covered at the convention. It’s worth noting as well, that the convention center overall was packed. This was the first year E3 had been open to the public and there was a lot of people there. 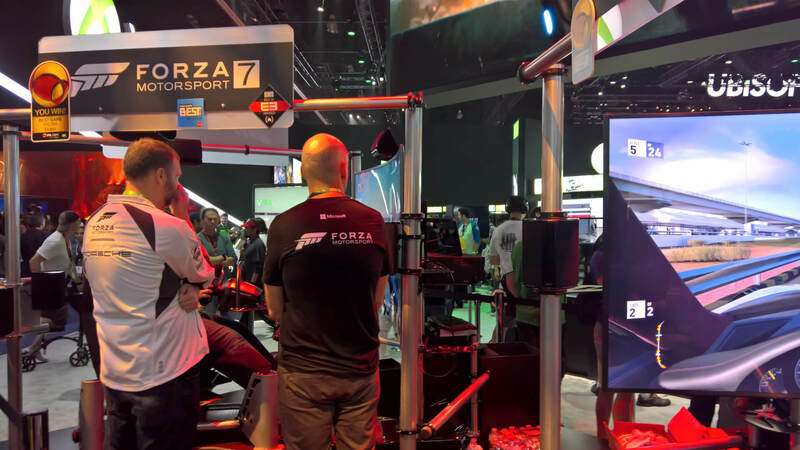 Queues for various games were long, but that didn’t stop me from having another go on the motion sim-rig setup for Forza Motorsport 7 on the E3 showfloor. Two sim-rigs for Forza 7 meant more fans could get behind the wheel, but queues were long! It was yet another race on Dubai, but this time, thankfully I managed to not crash so much, and I achieved some decent results too. Practise always makes perfect when it comes to these things, so I was chuffed about my gains already in Forza Motorsport 7 despite the title only being announced a few days prior to the show. Anyone who played Forza Motorsport 7 at E3 2017 also received a card with a unique code on the back. When redeemed, this unlocks a special E3 ‘Road Trip’ Driver Gear outfit for your avatar in the full game. It’s one of my favourite driver suits in Forza Motorsport 7 and it’s a nice way of showcasing my attendance at last year’s E3 convention. I also received a bunch of other goodies whilst I was there. This included a Forza Motorsport 7 Porsche t-shirt, rare Forza-branded socks, a Forza logo pin, and a unique, numbered E3-adorned Xbox Design Lab controller. 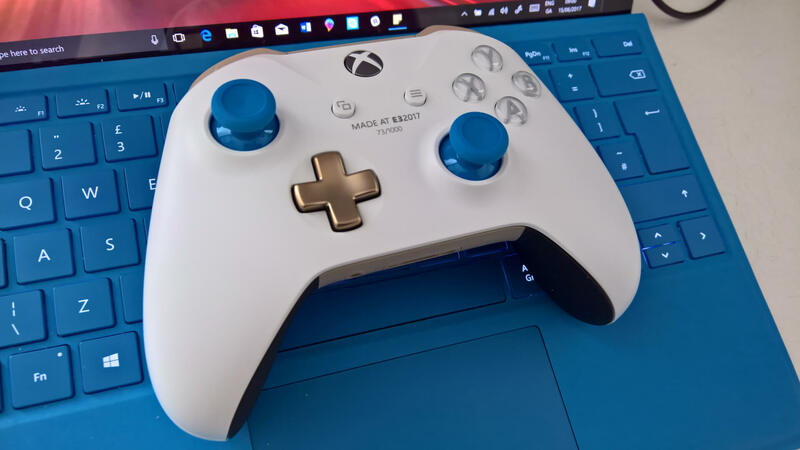 Here's my custom engraved and numbered Xbox Design Lab controller from E3 2017. That race on the motion sim-rig setup was also my last time getting hands-on with the game at E3 2017, so it was a good opportunity to soak in all the details on show in Forza Motorsport 7. However, I did get some time with the game again at the Goodwood Festival of Speed later that month, as well as at Gamescom and the Xbox One X Showcase Event in London ahead of its release. E3 2017 was only the start of a busy, packed Summer full of reveals and events leading up to the launch of Forza Motorsport 7 and the Xbox One X console. Overall, the experience of attending E3 2017 is one I’ll simply never forget. It has always been a dream of mine to attend the biggest convention in gaming ever since I begun watching E3 briefings in 2009. The Xbox E3 Media Briefing and the debut of the Xbox One X console with Forza Motorsport 7 were undeniably the highlights for me. 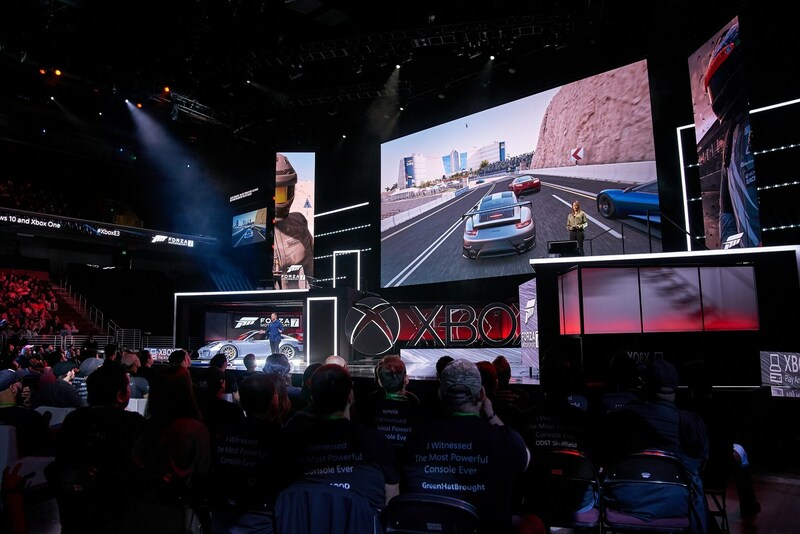 To see a car revealed on Microsoft’s Xbox E3 stage alongside the hotly-anticipated new Forza game that the community had been speculating on for months, as you can probably tell – it was just an incredible feeling. The Galen Center was packed as Phil Spencer addressed the fans, media and viewers. To cover all the breaking headlines and news announcements on Forza Motorsport 7 from the showfloor also felt immense. Internet in Los Angeles isn’t the best at all, especially if you’re relying on free Wi-Fi. Thankfully, the Xbox Media Lounge at E3 had a decent connection speed which meant I could write up the latest details on Forza Motorsport 7 as I learned more about the game. It was a fun experience all-around and I’m immensely proud of the coverage that it resulted in. The whole experience felt surreal. There was a lot of excitement and it felt like it happened in a blur almost. It’s a crazy wonderful treat for a diehard Forza fan such as myself, and with Forza Motorsport 7 being the flagship showcase title and exclusive game of the all-new Xbox One X console, E3 2017 was a special one to make my first E3. This was the Forza Motorsport 7 E3 2017 experience, and it’s been fun to reflect on those events that took place almost a year ago. The buzz, hype and excitement fused with the overall anticipation of Forza Motorsport 7 resulted in an unmissable, unforgettable experience. 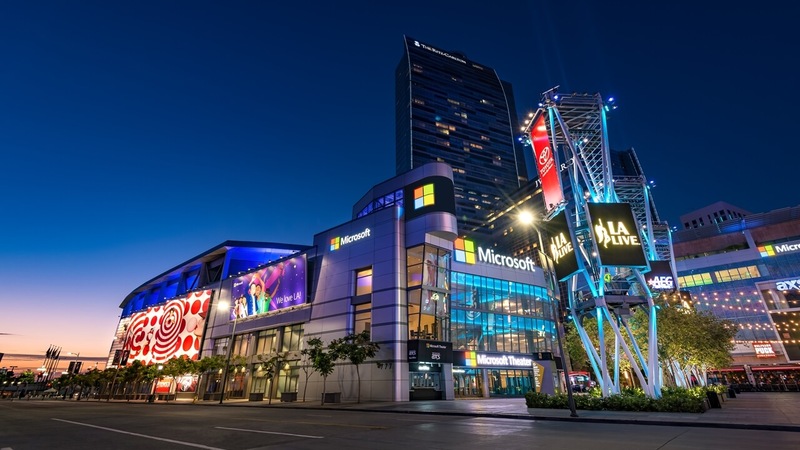 This year's Xbox E3 keynote and booth will move to a new home at the Microsoft Theater. We’re now officially less than two weeks away until the Xbox E3 2018 Briefing – live on Sunday, June 10th at 1pm PDT (4pm EDT, 9pm BST). 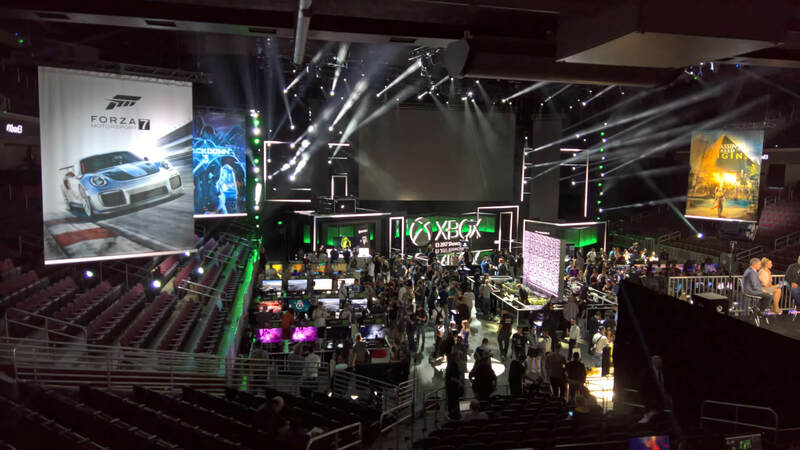 It’ll be broadcasted from its new home at the Microsoft Theater in Los Angeles, which means the company’s E3 2017 briefing was also the last one hosted at the Galen Center for the foreseeable future, which makes it an even bigger honour to have experienced the Xbox E3 keynote in-person last year. This year’s E3 will mark one year since the debut of Forza Motorsport 7, but it does mean that per tradition, we should most likely be receiving an all-new Forza game in 2018 with an expected return to the Horizon Festival. Unfortunately, I don’t think I’ll be making it out to E3 this year in-person due to expensive travel and accommodation costs, however, I will be covering everything related to the upcoming Forza title here on FullThrottle Media, so be sure to check back from June 10th onwards for all the details you need to know and my first impressions.